What’s love got to do with copywriting? Success relies on the rules of attraction. So get your relationship off the ground with these tips from top copywriters. What’s the game of love got to do with copywriting? Whether you’re trying to hook a guy or a gal, or trying to convince someone to buy your product or service… you need to understand the rules of attraction. To help you get your relationship off the ground, I’ve compiled a collection of quotes from top copywriters. Follow their rules of attraction and you’ll be guaranteed to excite the interest and desire of your customers. Before you put pen to paper, before you ring for your stenographer, decide in your own mind what effect you want to produce on your reader — what feeling you must arouse in him. On the average, five times as many people read the headlines as read the body copy. Copy is a direct conversation with the consumer. People aren’t interested in you. They’re interested in themselves. There are two motives to action: self-interest and fear. The secret of all true persuasion is to induce the person to persuade himself. The vast majority of products are sold because of the need for love, the fear of shame, the pride of achievement, the drive for recognition, the yearning to feel important, the urge to look attractive, the lust for power, the longing for romance, the need to feel secure, the terror of facing the unknown, the lifelong hunger for self-esteem and so on. Emotions are the fire of human motivation, the combustible force that secretly drives most decisions to buy. When your marketing harnesses those forces correctly you will generate explosive increases in response. Let me know how you get on. And Happy Valentines! 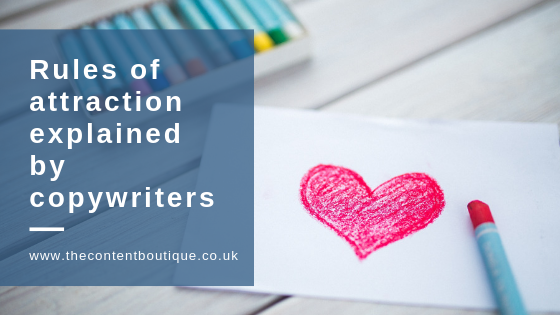 If you would like help from a copywriter to write communications that follow the rules of attraction, then do get in touch. Claire Hawes is a marketing communications copywriter. 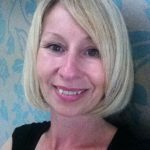 She enjoys writing engaging copy that helps businesses attract enquiries and sales. Claire’s experience mainly lies in the business to business sector. Her clients include both businesses and digital marketing agencies.